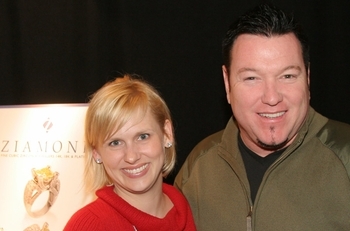 Lead Singer Steve Harwell of Smash Mouth pictured with Ziamond Cubic Zirconia CZ Jewelers VIP Staff Member. Ziamond features a variety of rings, earrings, bracelets, pendants and necklaces set with the finest hand cut and hand polished cubic zirconia cz available. All Ziamond cubic zirconia cz jewelry is set in 14k gold, 18k gold or platinum.